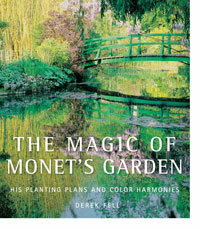 A century earlier, in 1883, when Monet settled at the age of 43 with his family at Giverny, he was a successful exhibiting artist and, never one to horde his money, spent his newfound wealth mostly on his garden, says Derek Fell in The Magic of Monet’s garden (David Bateman). 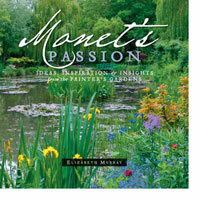 Monet initially had to convince the local residents and authorities to allow him to create the water lily pond, according to Elizabeth Murray Monet’s Passion: Ideas, Inspiration, and Insights from the Painter’s Gardens (Pomegranate), herself a passionate gardener and painter. He had bought land across a railroad track from his house, but then had to persuade the local authorities to allow him to create a prise d’eau, or water intake point, to intermittently divert water from the Ru, a year-round stream that empties into the Epte, a tributary to the Seine. Locals were concerned he would drain too much water and his exotic plants would contaminate their supply, but he eventually prevailed. Inspired by Japanese woodblock prints, Monet built several arched wooden bridges over the Ru that created elliptical reflections in the pond; the largest bridge became the main accent in the water garden. The carefully placed aquatic plants in the pond included tropical water lilies in extraordinary colors ─ amethyst blue, deep plum, lavender and sunset blends of yellow pink and apricot ─ as well as hardy water lilies which can be grown almost everywhere in white, yellow, coral pink, orange, rose, red and burgundy. I used to paint out of doors facing the sun. Today I need to avoid lateral light, which darkens my colors. Nevertheless, I always paint at the time of the day most propitious for me, as long as my paint tubes and brushes are not mixed up … I will paint almost blind as Beethoven composed completely deaf. Two years later, he was finally persuaded to have three operations to remove the cataracts on his right (blind) eye, which were successful. He destroyed many of the cataract-period water lily canvases, but kept and sometimes reworked those he felt were good. 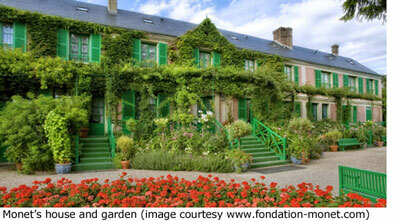 Monet died on December 5, 1926, after completing his Décorations des nymphéas. The magnificent series of 19 panels, each 6 1/2 ft high and up to 20 ft long, was installed the following year in two specially constructed elliptical rooms in the Musée de l’Orangerie in Paris’s Tuileries Gardens. 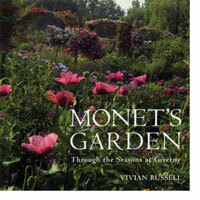 Gardeners in search of some inspiration for their own plots might find useful information in Vivian Russell’s beautiful Monet’s Garden: Through the Seasons at Giverny (Abrams), which describes the practical techniques of maintaining the garden, season-by-season, but the stunning photographs alone make this an enjoyable browse. 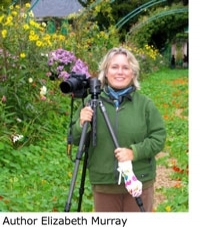 Another enjoyable walk-through the garden, which also presents interviews with knowledgeable people, is Monet’s Garden at Giverny: A Video Portrait of the Great Impressionist’s Garden, 55 mins, available in VHS and DVD in NTSC and PAL formats.